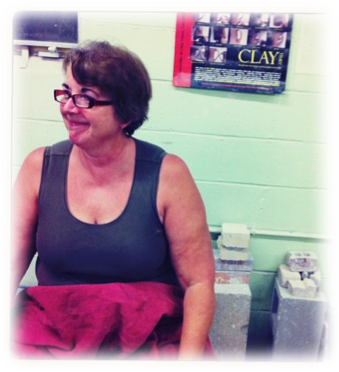 Some of the old-timers at Austin Pottery Studio & Gallery remember a fellow Potter named Debi Ballard. She passed away a few years back on March 4, 2014. Many of us were thrown for loop in coping with this unexpected loss. In an effort to deal with our grief, Kit Adams, owner of the former Clayways studio, donated 3 ceramic platters to decorate and offer to Debi's three Sons, in Debi's memory. This year a team of merry potters, Patty Creamer, Deb Dixon and Sherri Hammack, finished out the platters that contained the names of many of Debi's family and friends. Those individuals had signed their names at the three memorial services that celebrated her life: one service for her pottery friends, another for her work friends, and the back-yard celebration with a mix of her family and friends. On Mother's Day, the platters were finally ready to go to their intended homes with Debi's three sons: Christopher, Matthew and Ben Glover. The platters were recently presented to Ben to distribute to his other two brothers. 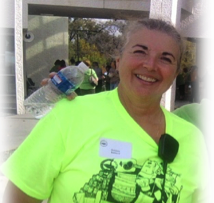 Debi was devoted to her family, a skilled potter, a steadfast leader at the Austin Empty Bowl annual event, as well as community organizer through her work at the state health and human services. She will always remain in the hearts of those who knew and loved her.